Please say 'Good morning', or perhaps 'Kalimera' to the moth which might have saved Socrates, though that is stretching a point even further than I normally do. This is the Hemlock or Defoliating Hemlock or even Poison Hemlock Moth, Agonopterix alstroemeriana. Hemlock was the poison which the Greek philosopher was obliged to drink after being found guilty of corrupting the minds of young Athenians and not believing in the city state's gods. Ever a wit, although none of his writings survive and our knowledge of him comes largely from his most brilliant disciple, Plato, he had suggested to the judge and jury that the correct sentence should be a state pension and free dinners for life. He like feasts, which also appeal to me. If the deities of Athens, or anywhere else, had made the Defoliating Hemlock Moth a little bigger, it might have wiped out its deadly foodplant in time to save Socrates. But as you can see, it is another of our smaller-than-a-thumbnail friends, albeit very pretty when you look closely. Its botanical name is curious, given its actual foodplant. Perhaps it feeds on alstroemeria (pictured right) as well. Here is another mini visitor, one of the paper dart-like Crambyd family. I shall guess Catoptria falsella. And here, think, is a handy chance to show you the Common Footman, first, followed by the spindlier Scarce Footman. As with one of Sue in Comments on Monday, these little creatures are very common among the eggboxes at the moment. I have a number of other moths in the bag which I'm picturing for my own use, when it comes to sorting out what's been and what hasn't, at the end of the summer. A very familiar moth this morning but no apologies for that because it's a favourite. 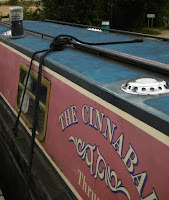 I've also photo-ed it this time from a couple of unusual angles. Remember Lord Alfred and Sir Bedivere? The Herald is shield-shaped too and has a definitely heraldic colouring on its upper wings. Below, as you can see in my third and fourth pictures, it looks as though it has been caught in the beginnings of a small snowstorm - interesting flecks of white just starting to settle. My headline btw is supposed to represent an heraldic salute on the trumpet. Note also my thumbs etc for scale. Perhaps unwisely, I assume that everyone is delighted and impressed by the regular appearance of my thumb in the photographs here. Not so this Small Rivulet, above, which did a panic-stricken runner, or flutter, when I slid a thumb under the transparent trap cowl on which it was perching. My hope was to show how tiny the moth is; half the size of my thumbnails, but I'm afraid the experiment didn't work. All went well, however, when I moved from the tiddlers to the jumbos. Here, in beautiful harmony, are my thumb, one of my fingers, a Poplar Hawk and a Privet Hawk and my pyjamas. It was also nice to see one of those weird-looking creatures, a Pale Prominent, perched on the edge of the trap bowl and looking like a fragment of Cadbury's Flake, albeit gone that milky colour which chocolate goes when it gets old. And right on top of the rainshield, simple but brilliantly effective invention of Mr & Mrs Robinson who designed the Robinson Trap, was this Lesser Broad-bordered Yellow Underwing: Update: Sorry, it's a Least Yellow Underwing - many thanks for correction in Comments. Finally, tucked up in an eggbox, we have a fine, russet-coated gentleman which I believe to be a Lesser Broad-bordered Underwing. But I am often wrong. 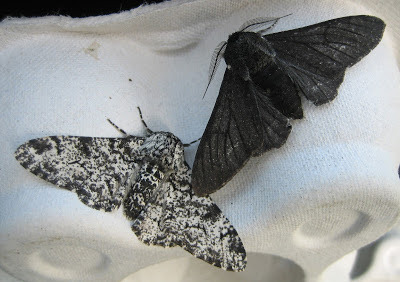 I was very pleased to see a melanic, dark form of the Peppered moth in the trap this morning - the celebrated form carbonaria which plays such a part in online discussions about evolution. I don't know whether I should advise you to pursue these as they can be addictive, both because of the interest of the topic and also the passion shown by some participants, especially on the non-Darwinian side of the debate. I'll say no more, having discussed the issue many times here. The only novelty I can claim this time, apart from the fabulous appearance of both my thumb and my pyjamas in the pictures, is that I made a deliberate effort to target the very few sprinklings of white 'pepper' on the moth. They are on its 'face' and forelegs. Everything else is sooty as our old chimneys used to be in Leeds. I'm also re-posting a picture I took two years ago showing carbonaria alongside the standard form - that night they flew in together. The difference is striking, but both are the same moth. A blitz on the veg patch today was rewarded by the discovery of several Cinnabar caterpillars, one of the reliable highlights of the moth enthusiast's year. I love this moth - red and greeny-black when an adult - here are a couple of pics, below - and yellow and black in tigerish stripes when a caterpillar. The warning colouration is striking and, as you can see in the closer-up of the pics, it comes with an additional arsenal of spiky hairs. The caterpillar is also poisonous to birds. Interesting that we humans have chosen yellow and black as our warning sign for anything hazardous in the nuclear field. These caterpillars were on groundsel, which we spared. Their favourite plant is ragwort which is, most unfairly, the target of ill-informed alarmists. A beautiful plant whose vivid yellow cheers up waste ground and neglected fields, it needs as many advocates and friends as possible. The original cinnabar is a red gemstone which, when crushed, provides the pigment for vermillion paint. 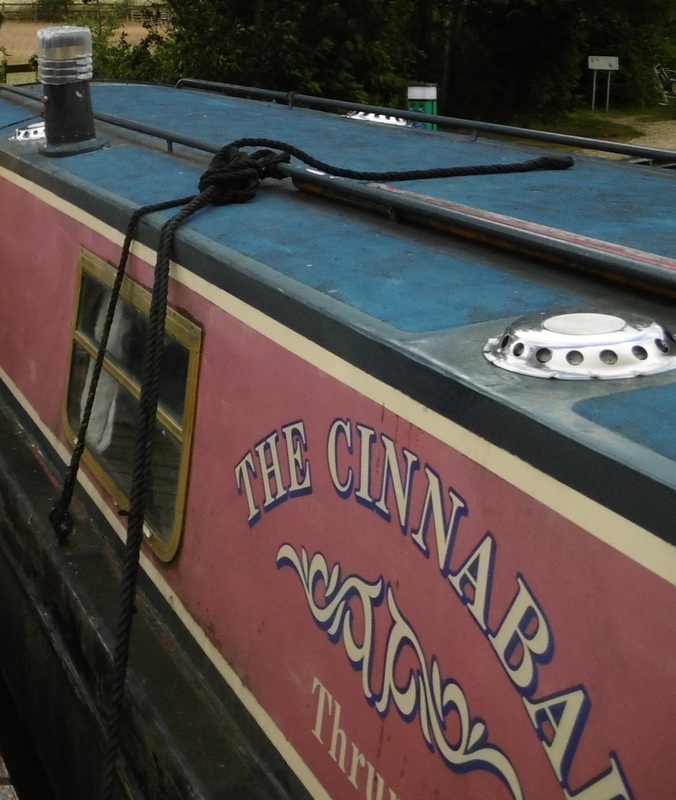 We have nice friends and neighbours here who have a narrowboat called Cinnabar on the Oxford Canal. Here she is. After last year's excitements over the Death's Head Hawk moth, I keep placing the trap optimistically on our potato patch, which is the biggest we've ever planted (for both culinary and entomological reasons). No luck so far, but a very fine Privet Hawk paid a call last night in between Friday's downpours and the further heavy rain which is forecast today. The chief feature of the eggboxes, and the surrounding potato plants, was an army of Footman moths, as if our humble veg patch was the aftermath of an 18th century ball with carriages lining up outside to collect dozy revellers in the early morning. They were so omnipresent that I didn't even notice the one in the background to this photo, below, of a Brimstone, a moth whose cheerful colouring I can never resist. For the rest, it was a busy night with over 350 moths in the eggboxes but nothing new so far as my limited skills could discern. Goodness knows what this pug is, immediately below; I was kindly given a guide to British pug moths in return for a talk to Leeds Philosophical and Literary Society but it has left me none the wiser, I am afraid). I have captioned the others, I hope correctly. After the showy delights of Blenheim butterfly house, UK moths inevitably seem a little low-key. But if you have time to examine them closely and unhurriedly, their modest virtues soon reappear. The delicate creature topping the post was something I almost overlooked in the crowded eggboxes. Quite small - little more than an inch between wingtips, it has the classic Laura Ashley look of the 'Wave' family of moths, enhanced by that scalloped shape and the demure and simple colouring. The Single-dotted Wave shown left is another of this type. So too is the Yellow Shell below. A second new arrival for the year was this Gothic Moth, whose tracery of different greys must have reminded me the 18th century British moth-namers of the church architecture which surrounded them, as it does us today. A good comparison, don't you think? The immigrant species, the Small Dotted Buff, is quite common this year, as other enthusiasts are reporting in this part of the UK. Here's my latest, below, followed by a handsome Marbled Minor or Small Marbled Minor and the micro Udea olivalis. Lastly, I was ruminating about scale the other day, and my hope that readers would eventually become as familiar with the dimension of eggboxes as I have. To help, here is a Leopard moth palling up with a Grey or Dark Dagger on one of the box cones, whose standard size is an invaluable guide to the dimensions of my moths.